Bishop Skip Adams called together a Diocesan Visioning Committee in March 2017 to formulate a diocesan vision to incorporate all parts of diocesan life in The Episcopal Church in South Carolina. Drawing inspiration from historic symbols of our diocese, the Visioning Committee has adopted a Vision Statement that calls upon the legacy of these symbols to unite us in our common mission moving forward. The Visioning Committee, the Bishop, and the Diocesan Council encourage all parishes and missions, all groups and individuals of the diocese to reflect on what these symbols say to us, how they have shaped our history and informed our present life, and how they point us to our future life together. This statement is a summary of the Visioning Committee’s work, but it is not the end of the conversation. 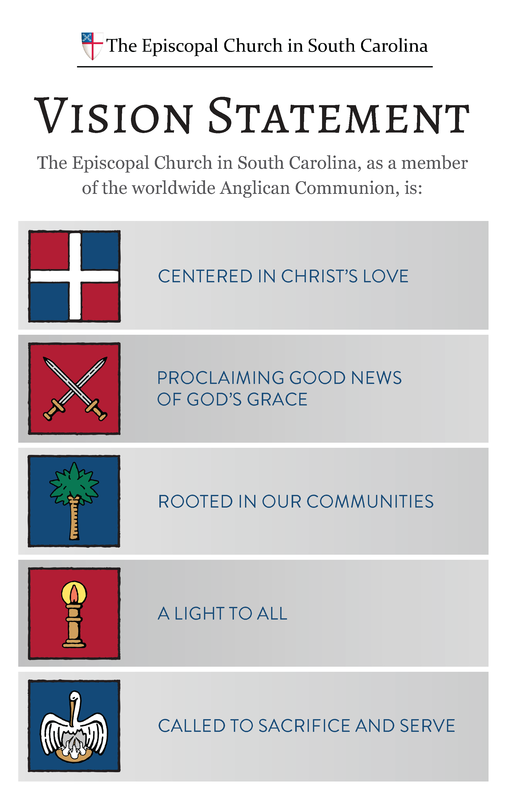 Instead, it will serve as a way to begin a conversation that will enable all in The Episcopal Church in South Carolina to respond to Christ's call to us today, and into our future life as a diocese. It was over a period of several months that a group of faithful folks met with me to develop a common vision for our diocese. That work, forged in prayer and a desire to be faithful to the mission and ministry to which our Lord calls us, brought forth the accompanying document. It has been adopted by Diocesan Council as our common vision statement, and I now share it with you that it might be seriously considered in our various faith communities. My hope is that every vestry or mission council will take time at an upcoming meeting to engage the vision and have a serious conversation about what it may mean for you as a faith community and for all of us as a diocese. Perhaps such a discussion will enable clarity to come as to your purpose and who you want to be as the people of God in service of the Gospel. Please share it in your parish newsletters and find an attractive way to display it where you gather as a community on Sundays. One parish already has had it enlarged to poster-size and inexpensively framed so that it can easily be viewed by all. If there are conversations or insights that the vision statement prompts, please submit them to Holly Votaw so that the stories can be shared with others of the diocese. Mutual encouragement builds up the body as we celebrate the Spirit’s work in our midst. Continued blessings to all in these Great 50 Days of Easter.